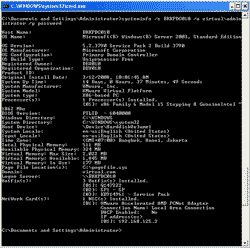 remote host is the IP Address or Hostname of the remote computer. username is the user on the remote computer. password is the password of the username. 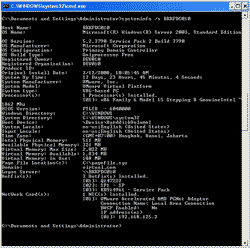 Note: This command is not available in Windows 2000 but you can still query Windows 2000 computer by running this command on Windows XP or Windows 2003 computer and set remote computer to Windows 2000 computer. If the current user logon that execute this command already has privilege on remote machine (for instance, Domain Administrators), you don’t have to use /u and /p. Display System Information on local computer. 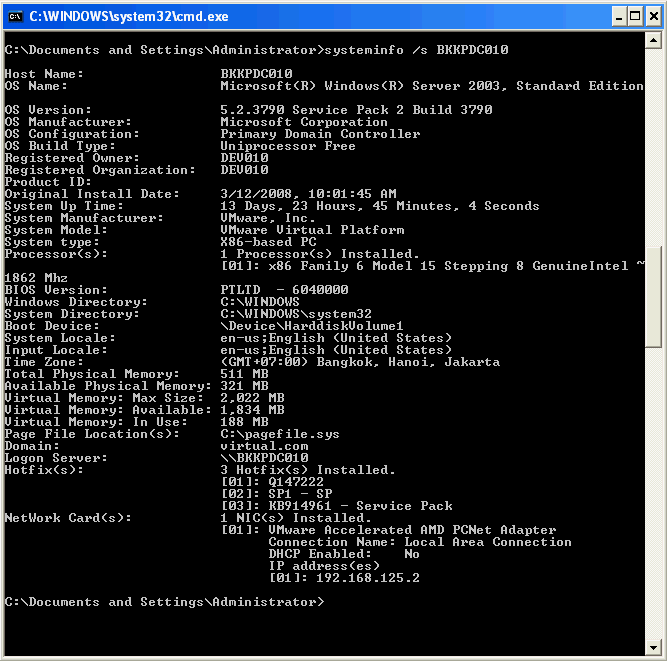 Display System Information on remote computer without specify username and password. 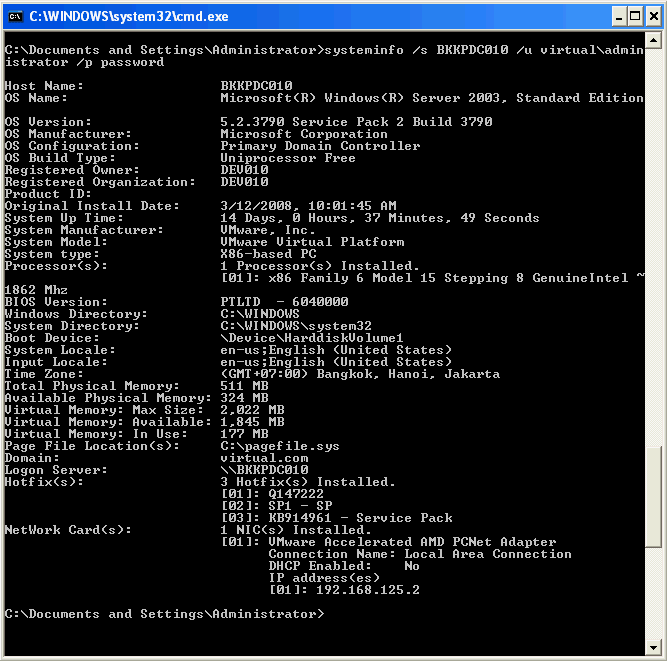 Display System Information on remote computer specifying username is “virtualadministrator” and password is “password”. systeminfo /s %computername% /u virtual\administrator /p [email protected] <- how to hide/encrypt this ? The reading goes to fast. Is there a “/P” or other command to slow it down. I know there was when one listed a DOS a file list, but has been so long that I have done that that I have forgoten about it. Thank you so very much. 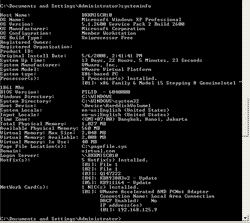 If you use command prompt window, you can scroll up to see the result if it is too long to fit in a screen. sir i want which command avalable i will know everything. Any way to find the remote host details without using password ? Type the password for as: type ur password here. I want to get the system information of all the computers and save into csv. I know for single system and i use below command which is working fine for me but for single system. Now I want the same multiple computers plesae help me. You can write a batch-file with a line for each computer. Or you make a list with all computernames, and read that file line by line, giving the computername as parameter when calling a function in you batch-file (asuming they all have the same username / password; like in a domain environment). If you want to scan the entire network, getting system info for all machines you encounter, it’s gonna be a little more work (like first scan the network, create a list with present computers, use that list as input on getting information for this systems). It can be done, but is gonna take some work. Or just make a loop in your batch-file, trying to get the systems info by just querying all iP-addresses in your network (that’s 254 possibilities in a class C network). The batchfile for that isnÂ´t that hard to make. What I’m more interested in, is is there a possibility to limit the output (like I don’t need the list of hotfixes). 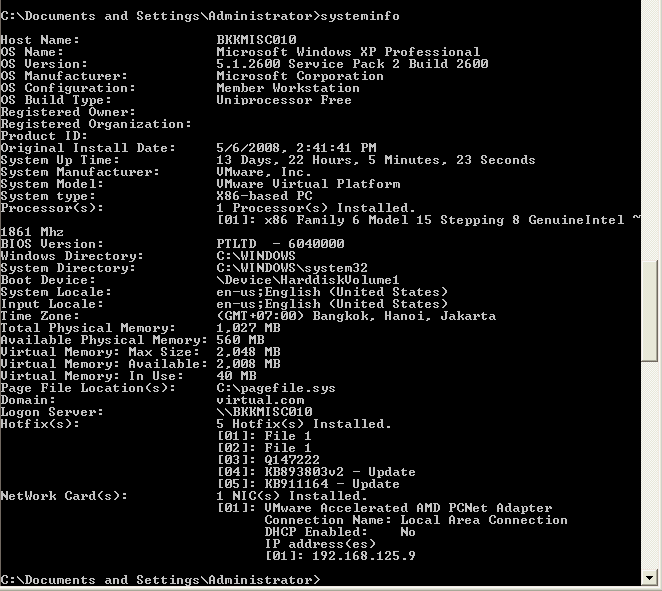 how to get the below output from command prompt. I have made similar batch file but some machine the system uptime show is “N/A” on the windows 2003 but on windows 7 it works. what could be the problem why showing “N/A”?